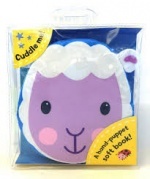 Suitable from birth this cute soft bunny character with comforting textures for baby to cuddle. On the reverse has black and white spots ideal for a newborn. Baby can play with the paws and explore the soft textured panels. Also chime noise in bunny’s head and crinkly ears. Little Grip Rattle Mouse loves to play all day and snuggle up at night! Squidgy and ready for a squeeze, she rattles when you shake her.